The DM & Dine program at Storm Crow Manor in Toronto is now officially open. As one of the GMs in the program, I hope that you will take a look at it. 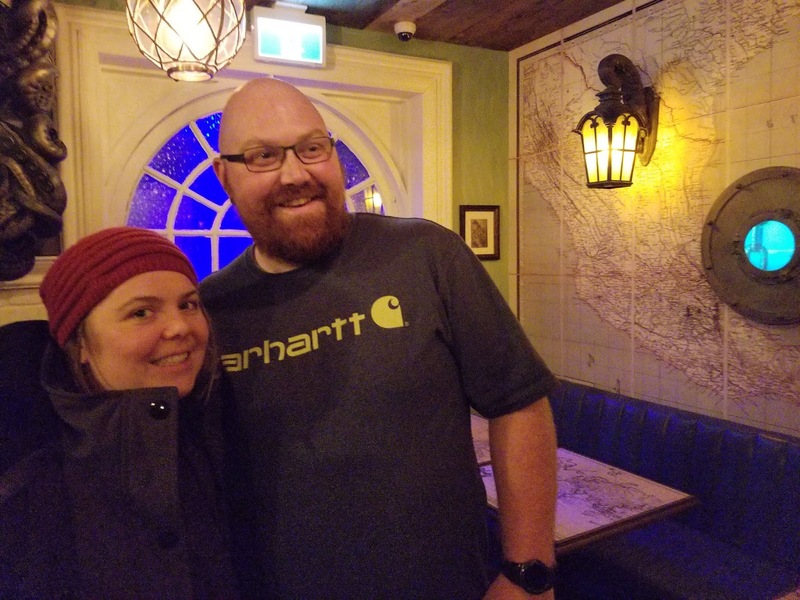 "The main quest of the DM & Dine program is to give new players, experienced player or just DMs who need the night off the chance to come play the tabletop RPG of their choice with one of our expert dungeon masters. Don't worry, we will supply you any provisions you may need on your journey: characters sheets, dice and of course – food is included! Each player gets their choice of appetizer and entrée for their journey." Please allow me to facilitate an evening of great food and high adventure! The question came up on Facebook recently: Should players be allowed to read the GM section of RPG rulebooks? I thought that it was an interesting enough question to crosspost my answer here. Encouraged? That's a different question, because you can't unlearn what you see....and, regardless of being "really outdated and obsolete", the opportunity for true discovery of the fictional milieu can be removed by knowledge. This is analogous to film spoilers, in a way. Which is how you get a game like Dungeon Crawl Classics, which actively encourages the GM to make new monsters, has no standard magic items, and even suggests that the GM make campaign locations where the forces of magic work....differently. 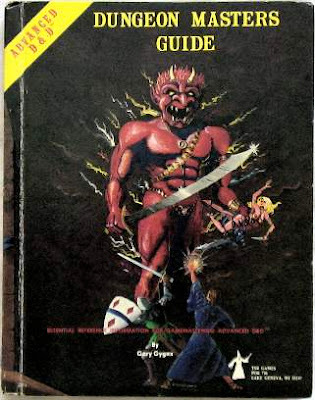 If you can remember that magic when you first played, when you were facing some skeleton or goblin or whatever, and you didn't know what it could do.....or when the magic thingamabob you discovered really seemed special, it was because of the information disparity between you and the GM. The GM knew the skeleton was beatable; you did not. The GM knew the blunt mace was going to work better than your spear; you did not. The GM knew what the thingamabob did; you did not. For some of us, that sense of discovery is actually what the game is about. At some point, through experience or through reading the monster and GM books, you learned the ropes. The game shifted. It became about how the pieces were used, rather than discovering what the pieces were. That information disparity was about the current (and extended) situation - the particulars of this encounter or that adventure. Rather like most fantasy fiction itself, the process of discovery narrowed from not even knowing what a word like "goblin" was going to mean in the context of the fictive world to wondering how common tropes are going to be combined this time out. I run Dungeon Crawl Classics because you can read the book cover-to-cover and that magic will still be there. There is no monster book to memorize. There is nothing to un-know. Last weekend, I drove to Guelph, Ontario to attend GenreCon at the Delta Hotel & Conference Centre. GenreCon is primarily a media-based event, with a lot of cosplay, but fellow judge Chris Jeffers and I did our best to represent! One issue that occurred with the programming was that DCC event times, while clearly listed on the website, were not clearly listed at the event. 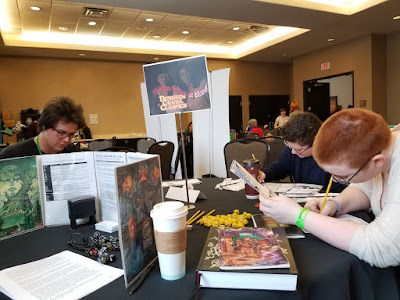 Nonetheless, on Saturday I was able to run Thirteen Brides of Blood and The Imperishable Sorceress at the convention. Because turnout was insufficient to run two tables, Chris joined me at mine on Saturday, and I got to be a player in his Sisters of the Moon Furnace game on Sunday. This turned out to be the best-attended game of the convention, with Chris having to handle a very full table! Neither Chris nor I had received swag for these events in particular, but Chris had managed to put together not only a nice amount of stuff to give away, but set up a generous raffle to support the United Way. All in all, it was fun, and I would do it again. I would try to plan better, and make sure that a schedule was posted at the convention, though! 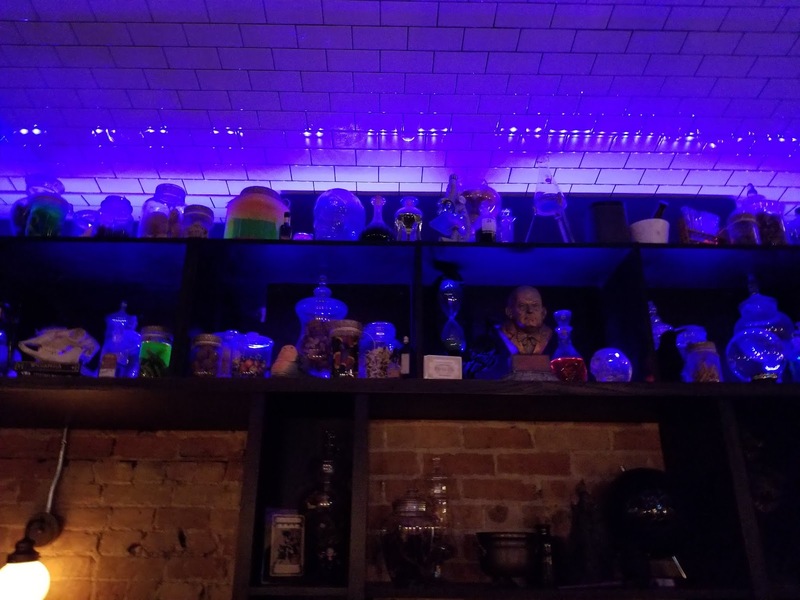 Storm Crow Manor, which bills itself as "Canada's Nerdiest Bar" has opened a location in Toronto. So, two days after Christmas my two older children, myself, and their respective partners went there. 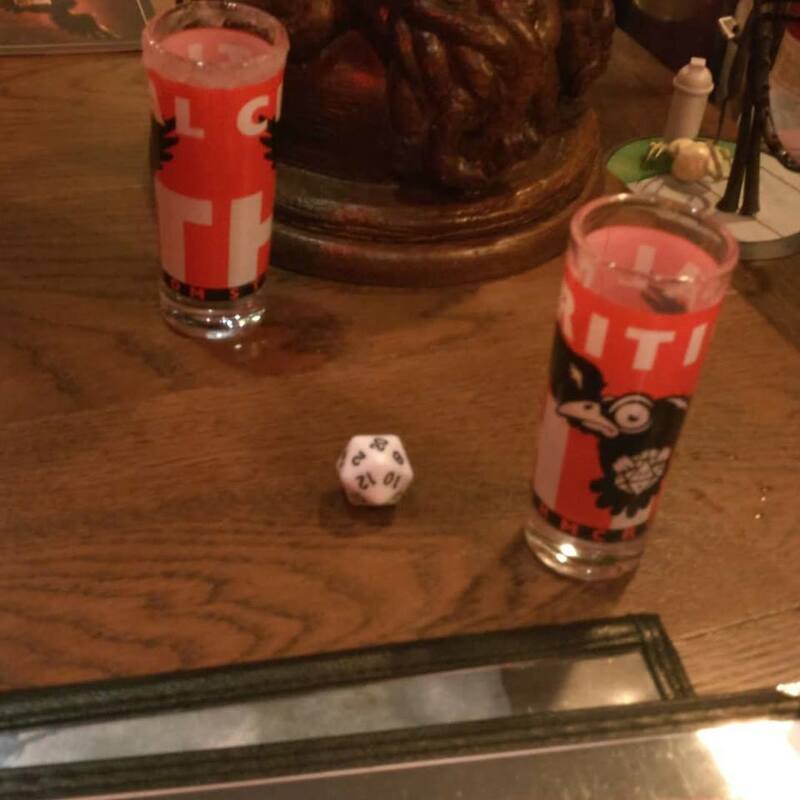 After all, they have a shot menu where you can roll 1d20 to get a random shot! I'll get the disclosure bit out of the way upfront. Storm Crow Manor in Vancouver has a rent-a-DM program, and Storm Crow Manor in Toronto is creating a program like this. It may well be possible, in the near future, to book an evening or weekend day where I run you through any Dungeon Crawl Classics or Mutant Crawl Classics adventure that exists - I own them all - or you get to playtest something new I am working on. I have already talked to the general manager at Storm Crow Manor and this looks like something that is going to happen. So, feel free to keep that in mind. I found the food to be good. 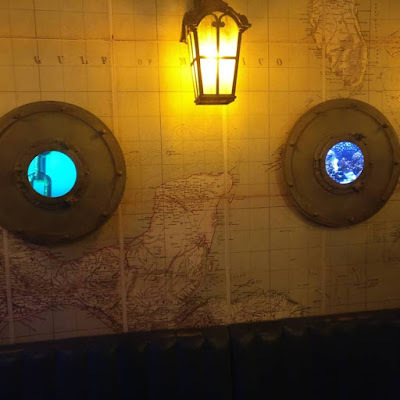 You could probably find the same meal for cheaper, but you wouldn't get the same decor. If you are pinching pennies (and all of us are from time to time), you can get an idea of price range from their menu. And, yes, you can roll 1d20 for a burger, too. Our table ordered a starter of Legendary Chickpea Fries, which were actually quite good. I had the New New York Strip, medium rare, which was great....but I should have upgraded and gotten the peppercorn sauce! I also had my first sour beer, which was an interesting experience. One I would definitely try again! Dinner was in a room modeled after the bars in Twin Peaks and the Overlook Hotel from The Shining (Stanley Kubrick version). Walking through the Manor showed various fantasy, horror, and science fiction themes. There is a statue of Cthulhu. There is a beholder mounted over a fireplace. There is a rancor head mounted on one wall. 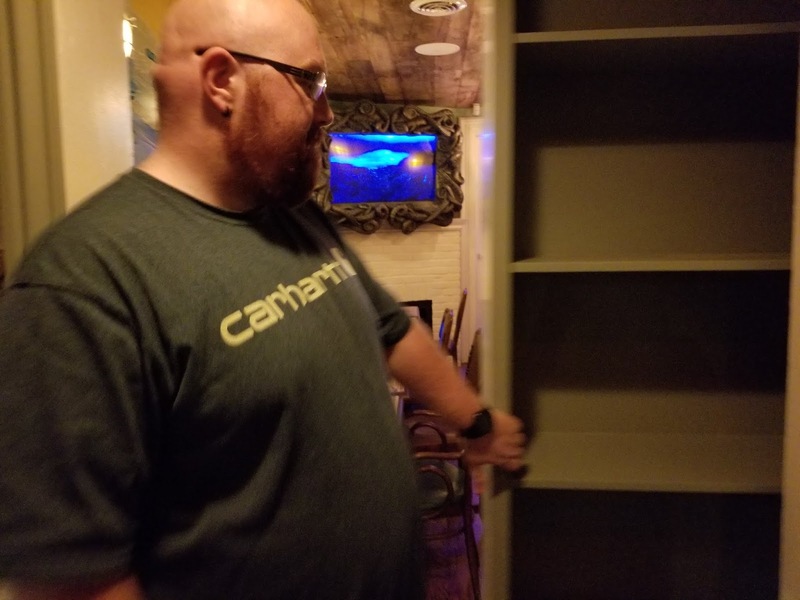 I am told that this is still a work in progress, and that there will eventually be a TARDIS to pass through on the way to the room we had dinner in. My understanding is that the summer patio furniture is also going to be interesting. Storm Crow Manor also features a secret door built into a bookcase, which leads to a room based off of the Nautilus from Jules Verne's Twenty Thousand Leagues Under the Sea. Going down to the bathroom requires passing through a hall that is lined with skulls. 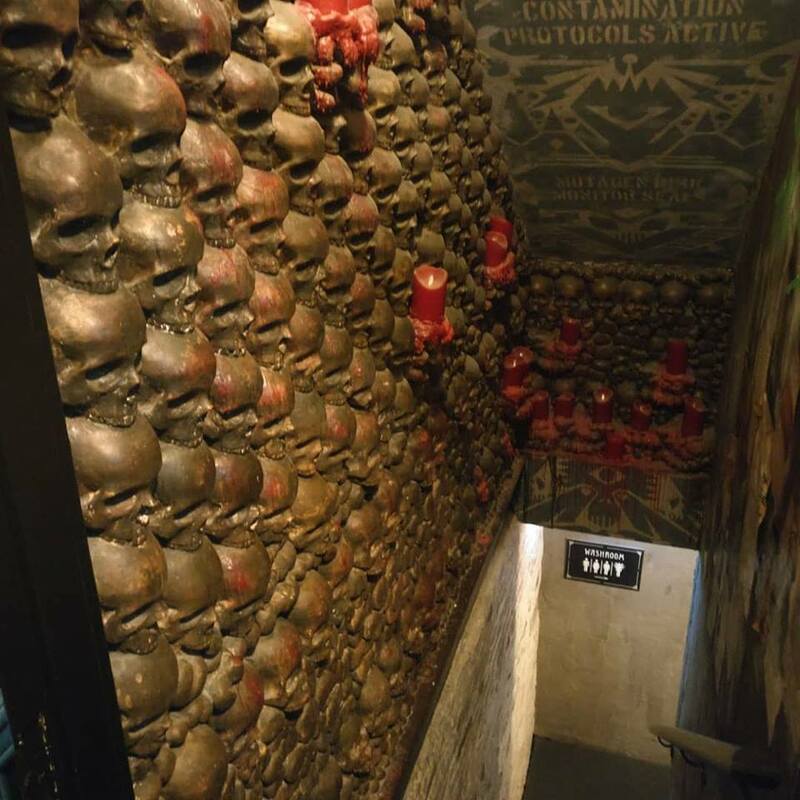 The individual rest rooms also have interesting and thematic decor. After dinner, we were able to get a seat at the bar near the Jules Verne room. And yes, we did roll for shots. I managed to roll a critical hit on my third go. 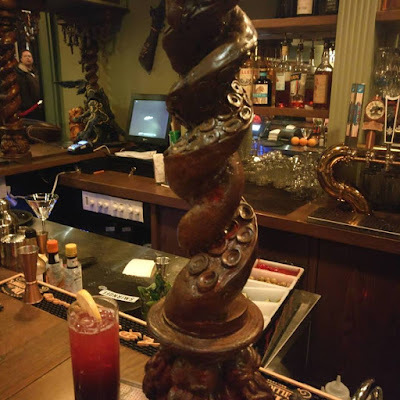 The drink menu included quite a few interesting concoctions. 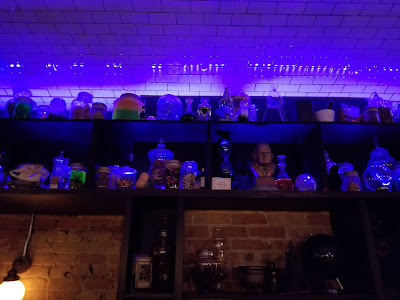 I found the Corpse Reanimator particularly enticing, but other drinks, such as the Romulan Ale, were also pretty good. There were group cocktails, which we did not get, but the presentation of the Dark Side Bowl made me wish we had tried a Pan Galactic Gargle Blaster. Another time, perhaps. But the bartender that night, Scott, sold the experience more than even the decor. Could it be that my entire reason for writing this post is to let the management know how excellent Scott is? His banter, delivery, conversational skills, and simple enjoyment of his job (or damn fine acting if he doesn't love it!) made that part of the evening a real treat. The Storm Crow Manor website can be found here! Some of the pictures in this blog post were taken by Mike Bishop and used with permission. If you can, watch Breaking Bad and look at the background characters whose names you never learn. They all seem to fit seamlessly into the setting. Breaking Bad is actually a masterpiece in terms of examining how secondary characters fill out a setting, and in terms of how they can interact with the primary characters (including shifts in function over time). Published adventures often include statistics for NPCs you would never need to stat out for home games. Unless you are publishing, you probably need to stat less than half of the NPCs in an average module. 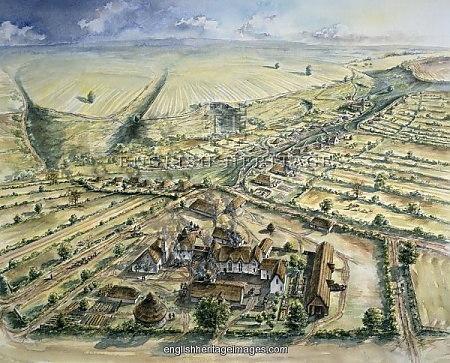 Fewer, if the module is The Village of Hommlet. That said, stat out anything and anyone you feel like statting out, or feel the need to have a statblock for. As with all prepwork, do what you need to do first, and then do whatever you feel like doing afterwards. You don't need to "create a mystery" for every NPC that you introduce, or even for every major NPC. What you may wish to do, though, is create a list of interesting things to learn about an NPC, and then link them to NPCs as the need arises in play. NPCs change over time. Let them get married, fall ill, have children, move, fall on hard times, gain windfalls, and die of sickness, old age, or misadventure. The goal is to have a dynamic setting, not a static one. In Part I, we talked about how NPCs can be used in a game. In Part II, we are going to talk about methods to create interesting NPCs. Again, this is just a collection of notes and observations based on decades of running games for various people and in diverse locations. William Shakespeare may argue that “That which we call a rose/By any other word would smell as sweet”, but in a role-playing game, the names that you give your NPCs is going to shape (in part) how your players see them. It is pretty easy to see that Sauron, although portrayed exactly the same way in The Lord of the Rings, would have been less imposing if he were named “Chester” by Professor Tolkien. Likewise, if your game is set in a pseudo-Roman area, calling the local tavern keeper “Bob” is going to take your players right out of the setting. Names need to feel like they fit. No one can spend the time – or, for that matter, has the organizational memory – to name every stray character that might be met in the average marketplace. It is a good idea to keep a list of 10 or so male and female names common to the area, so that if the PCs take an unexpected interest in the local greengrocer you can give him a name that makes sense for where he is, and what his social position is. I personally own half a dozen baby name books. A good book of this nature includes older versions of names, and tells you what the name means. The Internet contains dozens of similar websites, many of which break down names by culture and gender. These are excellent sources when devising such a list! “Special” NPCs – those you want or expect the players to pay attention to – should have names assigned to them already. Truly special characters should have unique names….Vos the Spell-Thief rather than Linda, for instance. If you are playing Dungeon Crawl Classics, Appendix S provides a treasure trove of ideas for names and titles. If you go back to Part I, and look at the uses of NPCs, you will note that “overshadowing the PCs” is not on that list. NPCs should not overshadow the PCs, but some NPCs should seem to temporarily do so if they are intended, for instance, as a foil or a credible threat. That list might also give you an idea whether or not to give an NPC a common local name or a unique one. A service provider or an instrument doesn’t need a cool name. A patron, though, is someone whose name you want the PCs to remember. You can also assume that any reasonably good author has named their characters using similar principles. This means that you can mine an author’s work for names – possibly altering them somewhat, and certainly avoiding obvious ones like Conan or Gandalf – to populate an area or adventure reminiscent of the author’s work. The names in Prince Charming, Reanimator, for instance, owe much to those in H.P. Lovecraft’s Herbert West, Reanimator. Likewise, the names in The Arwich Grinder come from Lovecraft, with only a slight amount of shuffling. 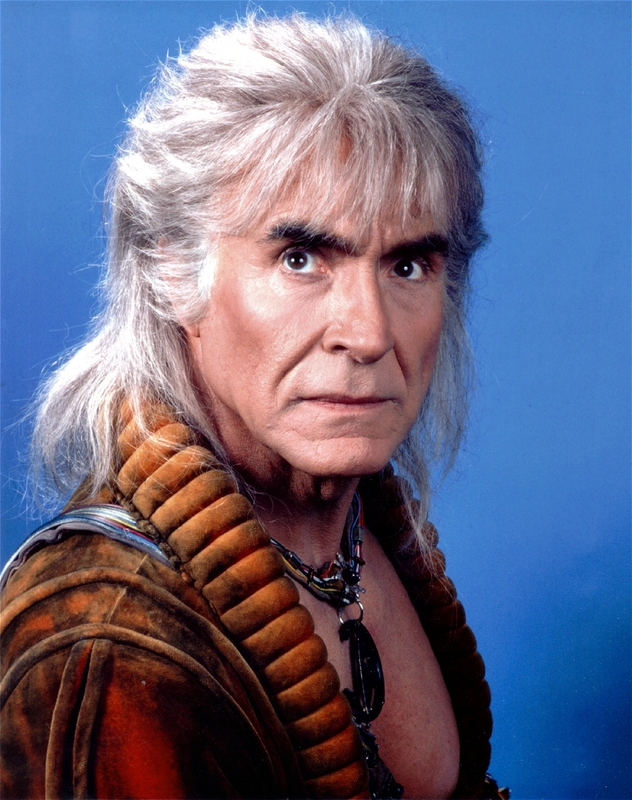 In Star Trek: The Wrath of Khan, Chekov’s reaction to discovering The Botany Bay comes before Khan appears on the screen. Throughout the movie, even when he is not on-camera, the other characters spend quite a bit of time talking about him….enough that the character can be meaningfully rewritten for Star Trek: Into Darkness, and the name means something as soon as you hear it. Likewise, in The Lord of the Rings, Sauron is never “seen” until Frodo, Sam, and Gollum are on the precipice of Mount Doom. Instead, Sauron is felt throughout the narrative. It is quite possible to have an NPC be effective in a setting even if the PCs never meet her. For instance, in one campaign there was a notable and mysterious thief called Jack of Roses. Jack of Roses always left a rose at the site of his high-class robberies, and he was terribly mysterious. No one knew his identity, and the PCs never found out who he was. This didn’t prevent the NPC from lending important colour to the urban setting. 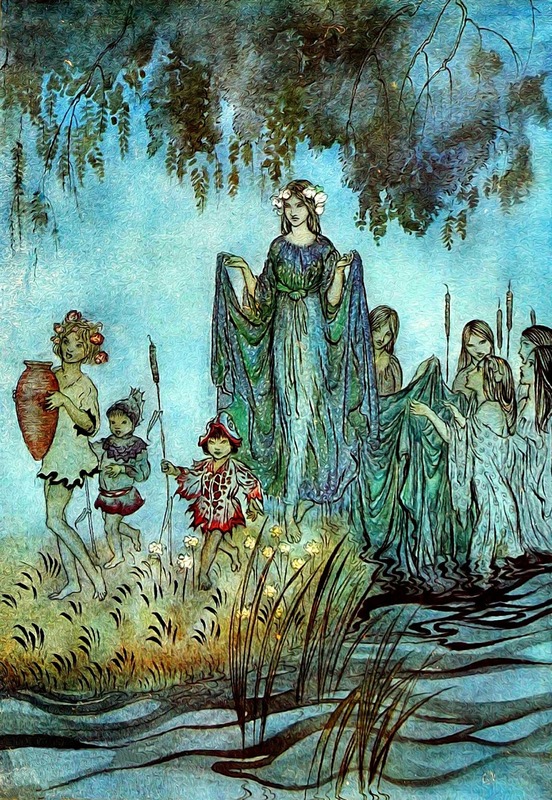 Nor did it prevent the NPC from being a reasonable riddle/foil – one of the PCs was actually mistaken for the “true identity” of the Jack of Roses. The point here is: How other NPCs react to your NPC when your NPC is off-screen is as important as how the NPC acts when he is present. You can create a credible threat by having everyone speak of “William Hornsby, the Moneylender” in hushed and fearful tones, even if the Moneylender seems cultured and polite in person. 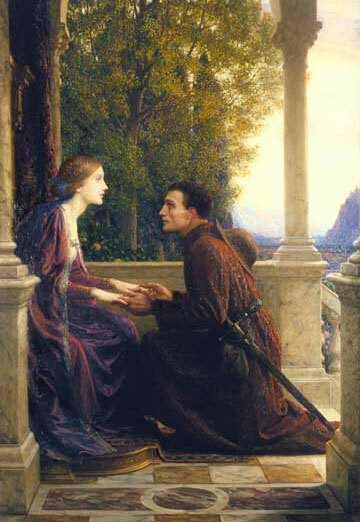 When a character’s reputation and actions do not seem to mesh, the resultant mystery highlights the character’s reputation – and importance to the setting. What an NPC does in a setting is often far more important than what an NPC says. If you want the players to know Lord Voldemort is a serious threat, sooner or later Lord Voldemort is going to have to actually kill someone. If, instead, Lord Voldemort is repeatedly beaten by school children who escape unscathed from their escapades, Lord Voldemort becomes a joke. If you want to know why the Harry Potter series became so much darker as it went on, the answer is “Because it had to”. ….But Words Are Important Too! On the other hand, important characters can be given a unique “voice”. This doesn’t mean that you literally have to “do voices” (not all of us are good at that), but that the character can have idiosyncratic ways of speaking. A nobleman and a ditch digger don’t sound the same. Education, philosophy, and dialect/slang (including terms related to an NPC’s trade) affect how a character speaks. I once ran the Caves of Chaos from The Keep on the Borderlands, adapted to 3rd Edition rules. When the PCs entered the evil temple, they got into an argument about the ethics of sacrificing people with one of the clerics they captured there. It lasted about half an hour of real time before one of the players (my son, in this case) realized that I was using Christian theology to justify human sacrifice, including that of babies. It was, perhaps, the highlight of the session. Another highlight occurred when a group of orcs were so impressed by another PC that they shifted from his opposition to his followers. For important NPCs, where you know or expect that there will be role-playing, it is often useful to have made a cheat sheet of dialogue snippets that you can throw into the conversation. Otherwise, the best thing you can do is try to develop and maintain good improvisational skills. See below for more on this. Spock raises an eyebrow and talks about whether or not things are “logical”. The 4th Doctor has a really long scarf and offers you jelly babies. Harry Potter has a lightning bolt scar. James Bond has his martinis shaken, not stirred. Zorro carves his trademark Z into walls and people. Superman and Batman literally wear logos on their chests. Many cartoon characters (including Sylvester and Tweetie, Donald Duck, and Daffy Duck) have speech impediments. Steal, Steal, and Steal Again! Further to this, you don’t have to make everything up yourself. You can pretend that various characters in the game are being played by chosen actors. You can take ideas from movies, television, or fiction … just file off any obvious serial numbers and you are ready to go! You can use your best Batman voice for the Captain of the Guard, and play the greengrocer with a Tom Baker flair. Unless you are a very, very good actor, it is unlikely that your players will know. It is even less likely if you mix & match. That nobleman is basically Spock, but instead of saying “logical”, he also womanizes like Kirk. If you watched the excellent medical mystery drama, House, you might not have noticed that House combines traits of Sherlock Holmes (analytical mind, drug problem, off-putting personality) with Watson (has a limp, medical doctor). The goal with stealing is to not make it obvious. You can have that dwarf act as though played by Sylvester Stallone, but avoid making him yell “Yo! Adrian!” You can play a riff off of Sauron, but don’t make him a world threat, and don’t make him manifest as a giant disembodied Eye in great need of Visine. Maybe the dwarves in your campaign world seem like they could come directly from The Hobbit. The elves have more than a nod to those in Poul Anderson’s The Broken Sword. The halflings would be at home anywhere in the Four Farthings or Bree. Boring, you say? Maybe. But also easily graspable by the people who sit down to play the game. Don’t believe me? Give a listen to the Glowburn Podcast when they start talking about Manimals and Plantients. Trying to figure out examples of the same from literature or other media is part of the discussion. It helps to get a mental picture of what a particular character type is about. The general rule is that using stereotypes as a shorthand is okay. Focusing on stereotypes is not. So, the strong smith whose back is bent from years of working the forge, or the Butterbur-like innkeeper is fine. In fact, using stereotypes is rather like using common names. They give you something to contrast the unusual types against. And they give you something to help hide the unusual types if they are meant to be a riddle. The thing is, all of us have some expectations about what it means to be a cleric, a wizard, a warrior, or a dwarf. Whether these expectations are conscious or subconscious, they are going to creep into your depictions of NPCs. You might as well embrace them, and make use of them knowingly. This doesn’t give you carte blanche to use harmful stereotypes about real-world groups of people, though. Know your audience, and try to avoid hurting people. If your players walk away from your game the better for having played it, that is excellent. If they walk away from your table with a head full of bias because of the way you depict real people, that is not so good. Try to work well with others. Which leads us to this – when populating your world, try to take real people into account. The NPC tables in the 1st Edition Dungeon Masters Guide are actually excellent for this, and I highly recommend using them sporadically. Another thing that works quite well is to characterize some NPCs as people whom you have met (although not people at the table). Pay attention to the people around you. It is good for you as a GM. It is also good for you as a person. And, for the sake of Crom, if one of your players tells you that his character is a gay male Ferengi who is attracted to Klingons, make use of it. That means Klingons who are not interested, and who can therefore act as foils, threats, etc., but it also means that, at some point, the player would like to Quest For the love of his character’s life. Make it so! Finally, after all this consideration, we get to talk about game statistics. This is actually the part where I have the least advice to offer, because statting out NPCs really isn’t that difficult. Have a page of NPCs available to use if you need someone unique right now. When you are reading an Appendix N novel or story, keep a notebook nearby. Stat out some of the people you meet in the story. Now you have some premade NPCs. Literally, use the statblock of another NPC. Your players will never know. In the event of a truly average character, AC 10, 2 hp, no bonus to attack, damage, initiative, or saves. There you go. You’re welcome. Many NPCs don’t need stats at all. Your PCs are unlikely to murder the local greengrocer. If they do, AC 10 and 2hp. If you are playing Dungeon Crawl Classics, there are statblocks in the core rulebook for various types of people the PCs might typically encounter. Use them. Modify them to meet your needs, if you can, so you don’t have to start from whole cloth. The Purple Sorcerer tools are a wonderful means for making crafted characters. Want a 5th level thief? You can have 10 options with the click of a button. Remember when you were jotting out stats for those Appendix N characters? Change their names, modify them as needed, and supply a new recognition handle to differentiate them from their source. Now you have some specially crafted NPCs. NPCs Don’t Follow the Rules. You don’t have to figure out a “rules legal” way to give your wizard a special power that you want, or give your thief lightning reflexes that grant him a bonus to Reflex saves and Initiative rolls. Just modify his stats, and be thankful that you are not playing a game where you have to get the math right. And, if you are playing a game where you have to get the math right, just modify her stats and treat it the same as if you went through the effort of doing the math. At the end of the day, the outcome is the same. Death Throes are not just for monsters. Steal, Steal, Steal, and Steal Again! Every NPC in every module you own has a statblock that you can reuse, or modify and reuse, or convert to your current system and reuse. Unless you make it obvious, the odds are that your players will never notice. Remember that the goal is always to get at least two hours play for every hour of prep work. If an NPC is only going to see play for 30 seconds, you shouldn’t be spending more than 15 seconds on him. If an NPC is going to see many hours of play over many sessions, it still shouldn’t take more than half an hour (at the very most) to create her. Most of all, have fun. That is why you are gaming in the first place! This post comes as a request from the Comments in a previous post. Almost every game is going to need NPCs. In fact, unless the PCs are the only living intelligent beings around, your game will need some. Even if there is no one to interact with directly, the presence of other people will probably be felt, like with the found documents and riddles in the first version of Myst. I am going to assume, therefore, that everyone reading this understands the basic concept. Likewise, most of this post applies to any role-playing game, and is not limited to Dungeon Crawl Classics. Basically, this is just a collection of ideas and observations arising from decades of play using various systems. If you are reading this blog, you probably know that quote as the tagline of the Dungeon Crawl Classics series of modules, starting from 3rd Edition days, and published by Goodman Games. I am going to suggest that you replace “NPCs who aren’t meant to be killed” with “NPCs who aren’t meant to survive” in your thinking. The first implies that the NPCs in question should die at the hands of the PCs, but the tagline is actually a reaction against modules where NPCs are given plot protection to make an adventure run as intended by its author. In the parlance of TSR-era Dungeons & Dragons, it is important to note that all NPCs were considered monsters, although not all monsters are NPCs. This meant that it is always okay to consider them as the opposition, to be met with violence – or even just simply as a target to be murdered and despoiled. On the other hand, as with many thinking monsters, talking to an NPC is often rewarded. 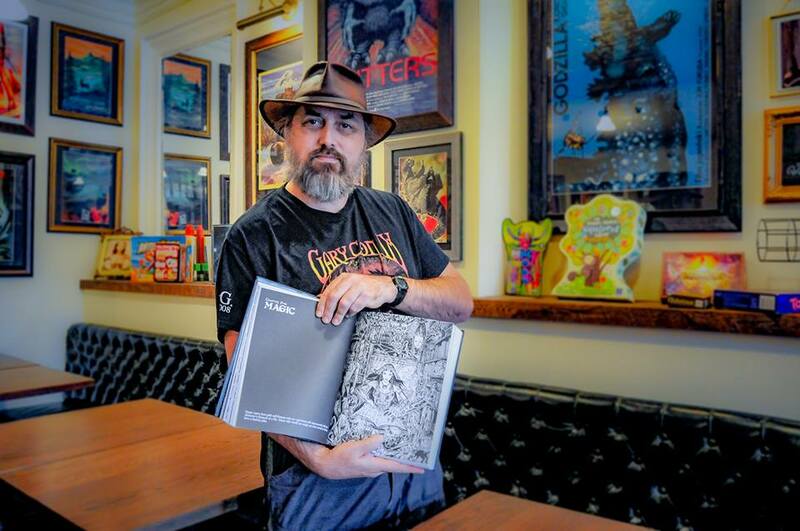 In the 1st Edition Player’s Handbook, Gary Gygax advises players to talk to creatures they encounter when it is possible. One of the upsides of this is that NPCs are NOT and should not be DM PCs. They do not have plot protection. They are not favoured. If the PCs kill them, they die. Or, if they do not die, there is some reason why they do not which makes sense within the milieu and tone of the game. Colour: There are people walking around in the marketplace. Someone is drinking in the inn. A server brings you your clichéd bowl of stew. Pilgrims are encountered on the road. Kids roll a barrel hoop down a muddy street. The Duke has hired people to repair the bridge. Etc., etc. The world around your PCs is filled with people. Many of them are just there because the world would feel barren without them. 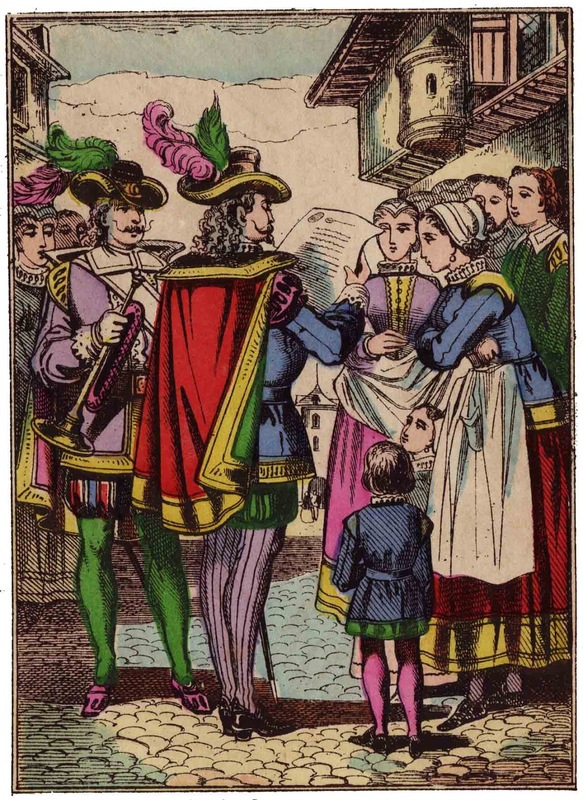 Concealment: The king disguised as a beggar, or the pickpocket, are going to stand out like sore thumbs if the PCs never encounter non-king beggars and non-pickpocket urchins. Don’t let that be your game. A vibrant population means that the assassin, the thief, and the would-be duelist don’t necessarily stand out initially. Determining who is important among the multitudes is a result of play, although some characters obviously stand out due to position (the Duke, the King, the old witch in the swamp) or circumstances (the weapon seller, the drunkards you are brawling with, the old witch in the swamp). This is similar in principles to a 2011 blog post, A is for Animals (or Lions, Tigers, &Bears, Oh My!). Change of Pace: Talking to things provides a change of pace from fighting them. Especially if talking can lead to fighting, or vice versa, if the encounter is handled poorly or well. (1) If the players are interested in an NPC, that NPC has just become elevated in the hierarchy of campaign importance. That doesn’t mean that he or she has become more important in the milieu. Rather, it means that the player’s interest makes them important in the game itself. (2) No NPC should ever serve only one purpose if they can serve two or more. People are complex. The NPCs we focus on should also be complex, not necessarily in the way they are played (more on this later), but certainly on the way they impact game play. Here are some functions NPCs can fulfill. Note that, while some of these are similar to each other, they are listed separately to encourage the GM to consider all of these functions. Ally: Someone who is capable of giving substantial help to the PCs, but isn’t an adventurer (or, at least, not part of the PCs’ party). The viscount who offers them men and equipment, the priest who provides sanctuary, the senator who smuggles them out of the city when the political winds blow against them. In fiction, Elrond is an ally who provides rest and sanctuary in both The Hobbit and The Lord of the Rings. Foil: A foil is an enemy, but not a combat-related enemy. Or, if a combat-related enemy, someone that the PCs don’t necessarily want to kill. A foil exists to complicate the PCs’ lives, causing irritations minor or major that cannot simply be solved with sword or spell. Tyrian Lannister, in A Game of Thrones, plays the foil to many other characters…in the early seasons, anyway. Even a character like Belloq in Raiders of the Lost Ark is a foil that gets his eventual comeuppance. The thing that the discerning judge must remember about a foil is this: If you don’t want the PCs to kill your foil, you need to supply reasons why they should not. Something must offset the irritation of having the character survive, be it fear of her power, his superior position each time they meet, or even a grudging admiration due to aid received from the foil in the past. And if the PCs do succeed in killing your foil, let the PCs succeed. Never, ever make your adventure rely upon the survival of a single NPC! This doesn’t mean that consequences should not apply. The king looks unkindly on those who destroy his agents, for instance, no matter how annoying those agents might be! Information Source: The NPC knows something the PCs need or want to know, and can convey that information to the PCs. Gollum knows a secret way into Mordor. Elrond can read the runes on Glamdring and Orcrist. A long-deceased NPC’s diary gives clues about an adventure location. A scarecrow can give directions to the Emerald City. And so on. One of the nice things about an information source, as mentioned, is that the NPC need not ever be met in person, and need not even be alive. Some information sources are manipulators, which attempt to give misleading or false information to cause the PCs to act as their instruments. Other information sources are well-meaning but wrong. The players should always be aware that no NPC is the “Voice of the DM” telling them what they must do, but rather all information sources should be taken with a grain of salt. In a game like Dungeon Crawl Classics, where “Quest For It” is the beating heart of play, information sources are especially valuable. How does one Quest For a particular spell, if there is no one who can say where such a spell might be found? These do not always have to be NPCs, but they must be something the PCs can interact with. Examples of information sources, living or otherwise, can be found in The Black Goat, The Giggling Deep, and TheSeven Deadly Skills of Sir Amoral the Misbegotten, among other places. Instrument: The NPC is a tool that the PCs may use…an extension of their own powers, as it were. Rhadagast the Brown is an instrument of Saruman when he goes to fetch Gandalf from the borders of the Shire. Tyrion Lannister uses Bronn as a physical instrument in A Game of Thrones, and is later himself the instrument of Daenerys Targaryen. A PC who hires an assassin to remove a foe has made use of an instrument. Unlike a support character, the PC does not generally supervise an instrument. Love Interest/Friend: The NPC is simply so likable that the players want to hitch their characters to him or her. When I wrote The Dread God Al-Khazadar, I created rules to encourage this sort of relationship. You can find rules in Drongo:Ruins of the Witch Kingdom that do the same. You don’t have to play out any part of the romance at the table, especially if it makes you or others uncomfortable, to establish that it is there. But having it there means that you have the option of creating PC dynasties in long-lasting campaigns, where the children of your adventurers grow up be heathen slayers themselves. Edgar Rice Burroughs certainly did this, giving strong love interests and full grown sons to both Tarzan and John Carter. There will certainly be a temptation to place friends, loved ones, and family in harm’s way. This does happen often enough in Burroughs’ novels, for instance, and even Conan’s temporary romances often find themselves in need of his rescue. Yet, Conan and Tarzan are going to get recompense for their chivalry which, frankly, you are unlikely to want to play out at the table. And, even if you did, rolling dice is not the same as canoodling for real. What happens in games is that players quickly learn to avoid emotional entanglements with their characters. There is no real benefit to the player, but it does give the PC a vulnerability that the judge (and therefore his imaginary enemies) can exploit. (1) Provide a benefit. The NPC might have information, or provide support. The PC may get a mechanical game benefit, such as extra hit points. Something within the game itself offsets the vulnerability that the player is accepting. Another example: Princess Annegret in Creeping Beauties of the Wood comes with a chest full of gold and a dukedom once her father dies. (2) Limit your exploitation of the vulnerability. Simply put, if you place your PCs’ significant others in danger regularly, your PCs will choose not to have significant others. In The Portsmouth Mermaid, the aforementioned Princess Annegret is never placed in danger, although she is often used as a foil to spur the PCs towards taking action in the situations they encounter. There is one scenario in Three Nights in Portsmouth where the princess might be placed in danger, but even that doesn’t require the judge to target her specifically. This is not accidental. Family may be included in this category as well. Opportunity: The NPC is a mark. Your thieves have to do something to earn the name, right? Here is someone whose jangling purse demands to be taken by stealth or force. Or someone whose home is in desperate need of burgling. Or who is ripe for a con. If you have thieves in your game (or rogues, depending upon what you are playing), let them act the part. Provide some opportunities. This doesn’t mean that all opportunities turn out the way that the PCs expect them to. I would highly recommend Jack Vance’s The Eyes of the Overworld for a number of great examples of how a clever and observational fellow may attempt to scam the world around him, both to his weal and his woe. Opposition: Some NPCs are out to kill you. They are more interesting if they also partake of another potential NPC function. Darth Vader was compelling as a villain; he was exponentially more compelling as Luke Skywalker’s father. The initial appearance of the Master in Doctor Who was fantastic; the Master as an ongoing foil to the Doctor is better. But be warned – a little of this goes a very long way. Few and far between should be the opponents who were old school chums, family members, and so on. Once in a while is spice. Too much spice destroys the dish. Patron: Possibly, but not necessarily, in the general Dungeon Crawl Classics magical sense, a patron is any NPC who sends the PCs on missions in exchange for something else (money, freedom, information, magical power, etc.). Again, the players should always be aware that no NPC is the “Voice of the DM” telling them what they must do, but rather all patrons should be taken with a grain of salt. But also, again, most patrons should be (relatively) level with the PCs, or the PCs will soon no longer desire the patronage of anyone. (1) Determining how to deal with Gollum allows Frodo and Sam to get across the Dead Marshes, and then make use of a secret way into Mordor. (2) Sam Tarly in A Game of Thrones is mostly cowardly, but by treating him well and giving him something worth fighting for, Jon Snow gains a useful ally. (3) Sherlock Holmes, attempting to find out where a goose was raised in The Adventure of the Blue Carbuncle, makes a recalcitrant vendor more forthcoming by pretending to be a gambler who stands to lose a tidy sum if the vendor talks. Note that these sorts of things should reward the player’s ingenuity rather than the character’s build, wherever possible. Even if the game is very build-centric, you can offer bonuses for how the players approach the problem….or even use their build as an excuse to present the problem more completely, while leaving the solution up to the players. Support: The NPC is literally going on adventures with the characters, and might be used as a replacement PC if there is a death. 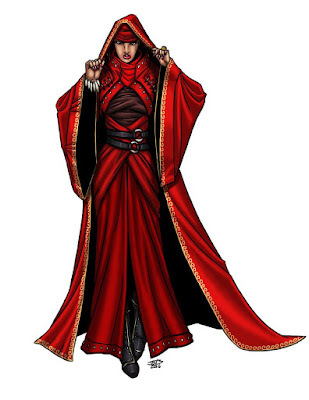 These characters – known in Ye Days of Olde as henchmen and hirelings – should have their own personalities, but are often left mostly to the players to order about and control. Note that familiars and intelligent magic items are often NPCs of this sort. Reward: The NPC is, or is the means to, some form of reward. The reward might be some esoteric knowledge, the start of a relationship, or even simply access to another NPC (directly or via letter of introduction). A familiar, a henchman, a lover, a friend, or a new patron are all potential rewards for successfully completing an adventure. Service Provider: The innkeeper who sells you ale, the farrier who shoes your mighty steed, and even the cleric or chirurgeon who heals your wounds are all service providers. So is the person who runs the baths or mends your armour. In general, they provide a given service in exchange for coin. Threat: The NPC provides a threat by which the PCs’ options are delimited. This can be relatively benign (the queen supplies the threat her tax collectors wield) or downright hostile (Sauron will send more orcs and Nazgûl, and probably obtain the One Ring, thus covering Middle Earth in darkness, should the Fellowship not proceed with care). A threat is an NPC who is largely offstage, encountered only through the actions of his own servants and/or reputation during actual play. Another good example of a threat is Ernst Stavro Blowfeld until near the end of You Only Live Twice. Likewise, the shadowy Quantum organization is a major threat in Casino Royal and Quantum of Solace, only to be downplayed in 2015’s Spectre. 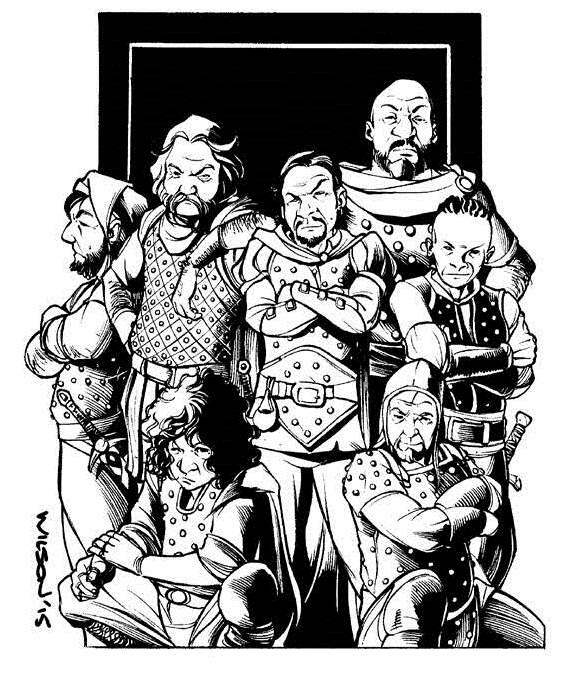 The important thing for the GM to remember about a threat is that, while it delimits the PCs’ options, the threat should not be used to railroad the PCs into a given course of action. The threat acts as context for the PCs’ choices, and can certainly lead to consequences, but a large part of the game is the players figuring out how to beat the limitations imposed by the threat – just as James Bond does when faced by the threat of Blofeld, or the Fellowship does when faced by the threat of Sauron’s dominion. Even if a threat is initially portrayed as all-encompassing, in should not be. There should always be a way – not necessarily an easy one – for the PCs to come out on top! And, importantly, if the players can come up with a reasonable way for doing so, it should have a commensurately reasonable chance to work!